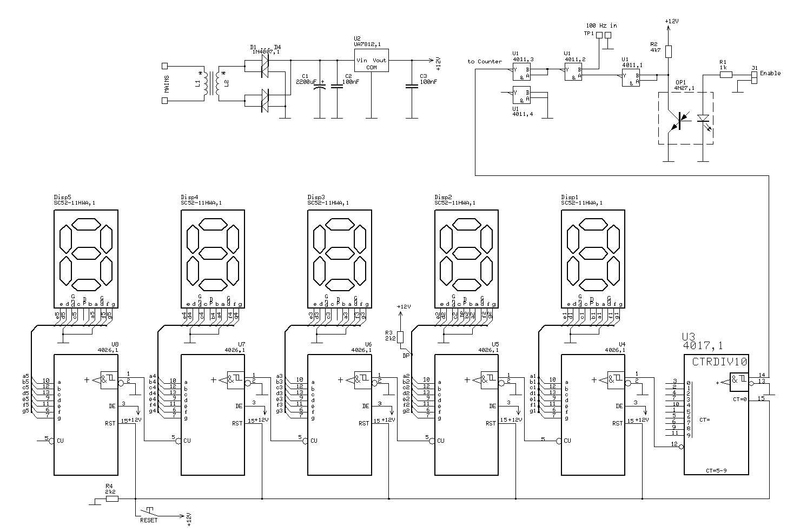 Here you can find the complete schematic for the counter device. You can click the image to view the large version. The power supply provides a 12VDC stable voltage to the counter circuit. The 230V alternating current (AC) is transformed to a output voltage of 12 VAC. This transformed AC voltage is then rectifier by the diodes D1 to D4. Capacitor C1 removes most ripples. This voltage is then applied to the inputs of a 7812, a component that outputs a very stable 12 VDC voltage. You might want to protect the 7812 against over heating by installing a heat sink. The capacitors around the 7812 are used to remove higher frequency components. The control logic is the most important part of the design. It passes the 100 Hz signals from the time base only when the (enable) input of the optocoupler is "high". I have chosen for an optocoupler because it isolates this input from any further circuitry. The transistor inside the optocoupler doesn't conduct if there is no voltage at the input. This means there is a high voltage at the collector of this transistor. This voltage is then inverted through a NAND port CD4011 (U1,1). There is a voltage on the enable-input: the output of NAND port 4011,2 is a block wave with a frequency of 100 Hz. There is no voltage at the enable-input: the output of NAND port 4011,2 remains "1" all the time. The signal from the second NAND port is finally inverted by NAND port 4011,3. Its output is either constantly "0" or a pulsing 100 Hz block wave. The counter signal from the control logic is now added to the clock-input of the first counting chip: CD4017 (U3). 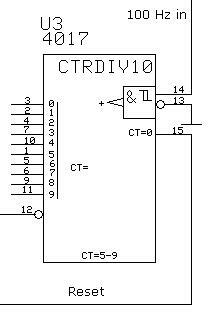 This chip is only used as a frequency :10 divider: the outputs are unused. 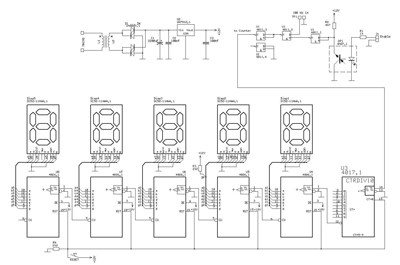 The CD4017 will output a "carry out" signal each 10 clock cycles. This means the 100 Hz from the control logic is now converted into a 10 Hz signal. With such signal you can perform measurements with an accuracy of 0.1 seconds. Displays 1 to 5 are used to indicate the time. I used 7-segment displays with a common cathode. Each display is controlled by its own IC: a CD4026. This is a counter to drive 7-segments displays. It provides a clock-in signal. Just like the CD4017 it also has a 'carry out' signal whose frequency is only one tenth of the input frequency: Each CD4026 acts as a 10-divider. Display 1 will count at 10 Hz, display at 1 Hz, ... Display 5 will finally count at only 1/1000 Hz. This means the counter has a total range of 9999.9 seconds. The counting value can be set to zero at any time: just push the RESET button.